Step:1 Click on Action Center icon on lower right corner and click VPN icon. Step:2 Click Add a VPN Connection. Step:3 Select and enter below settings into newly opened window. 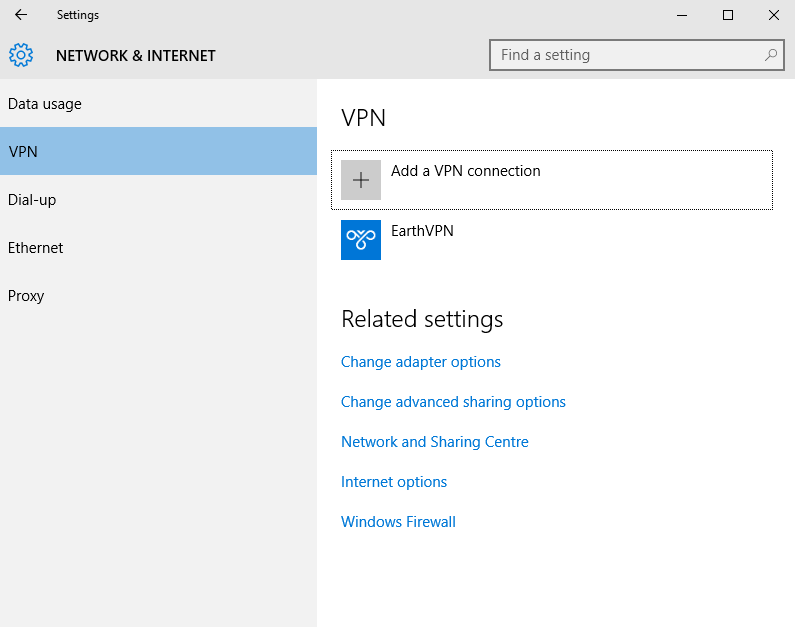 a) VPN provider.Select Windows (built-in) option. 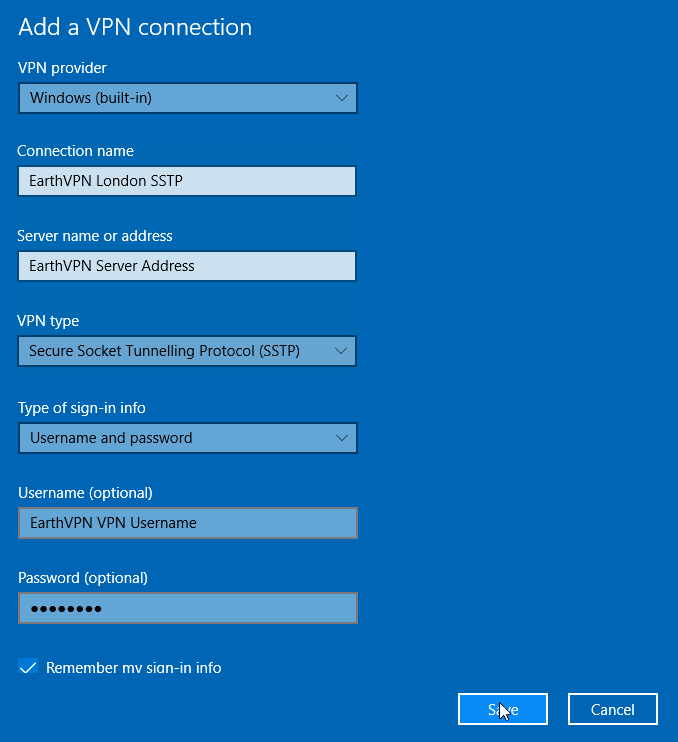 b) Connection name.Enter Connection name of the EarthVPN location you want to connect.For example you can enter EarthVPN London SSTP. c) Server name or address.Enter server address of EarthVPN location you want to connect.You may find the server address list on your account activation mail or on the below link. d) VPN type.Select Secure Socket Tunnelling Protocol (SSTP). e) Type of sign-in info.Select User name and password. f) Username.Enter your EarthVPN VPN username.Please keep in mind that earthvpn client area and vpn login details are different. g) Password.Enter your EarthVPN VPN password.Please keep in mind that earthvpn client area and vpn login details are different. 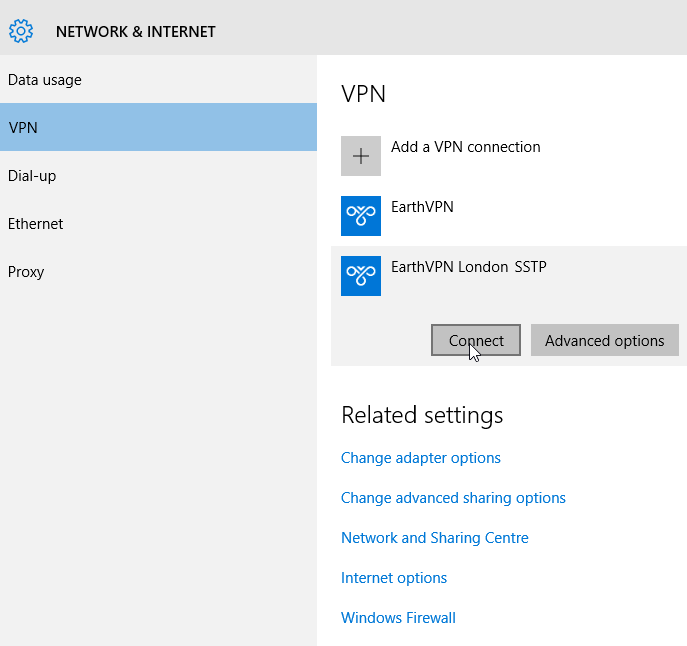 Step:4 Click on newly created vpn connection EarthVPN London SSTP and click connect icon.. Step:4 You will see Connected sign in case everything is correct.You may verify your IP and location is changed by visiting http://www.iplocation.net on your browser..